Total revenues for the Lufthansa Group in 2017 amounted to €35.6 billion, a 12.4 percent increase compared to 2016. The Adjusted EBIT of €2.97 billion was a substantial 69.7 percent year-on-year improvement. An 8.4 percent Adjusted EBIT margin was up 2.9 percentage points compared to 2016. EBIT for 2017 increased more than €1 billion to €3.3 billion. The EBIT increase includes the positive €582 million one-off effect on reaching a collective labor agreement with the Vereinigung Cockpit union for Lufthansa, Lufthansa Cargo and Germanwings pilots, as recognized in the December income statement. The Group invested €3 billion in 2017, approximately one-third up on the previous year. This was predominantly due to €900 million of investment into aircraft from Air Berlin. In 2017, our Adjusted ROCE (after tax) for 2017 improved by 4.6 percentage points to 11.6 percent. Despite the increased capital expenditure, free cash flow virtually doubled in 2017 to €2.3 billion, while financial debt rose 6.8 percent to €2.9 billion. This sum includes an initial €1.7 billion funding for the new defined contributions model of the flight attendants’ pension fund. Total pension provisions dropped by €3.2 billion in 2017. The year-end equity ratio stood at 26.5 percent, an increase of 5.9 per cent. The Group’s Network Airlines – Lufthansa, SWISS and Austrian Airlines – increased their Adjusted EBIT by approaching 50 percent to €2.3 billion. The Network Airlines raised their EBIT margin 2.6 percentage points to almost ten per cent. Despite the significant expenses in the context of acquiring capacities from Air Berlin, Eurowings reduced its unit costs excluding fuel and currency factors by 6.5 percent, while Adjusted EBIT increased by some €200 million. Despite adverse one-off factors related to market consolidation, the Group’s Point-to-Point Airlines improved their Adjusted EBIT margin by 7.3 percentage points and achieved a positive Adjusted EBIT of approximately €100 million. MTU Maintenance, the MRO division of MTU Aero Engines AG, has secured over US$3.7bn in contract wins in 2017, an impressive US$1.5bn more than in 2016, making 2017 the most successful year of the company in its history yet. In addition to significant contract wins, the MTU Maintenance network of facilities carried out over 1,000 repair and overhaul shop visits in a single year, taking the total number of visits performed to well over 18,000 in 2017. Of these, over 300 visits were for the V2500 engine family and 125 were for the CF34 family. Further highlights were achieved at MTU Maintenance Hannover, which has just superseded the 8,000th shop visit mark, and MTU Maintenance Canada, which introduced the V2500 line to its facility. Additionally, a new joint venture announced in December named Engine Maintenance Europe, or EME Aero for short, had been founded with Lufthansa Technik. According to current plans, the facility will be operational in 2020 and will have an annual capacity of over 400 shop visits. It will service the PW1000G-series geared turbofan engines as part of the OEM network. MTU Maintenance Lease Services B.V., operating out of Amsterdam, Netherlands, more than doubled sales in 2017 versus 2016. The young and successful start-up has welcomed over 60 new lease and asset management customers and nearly doubled its pool of lease engines. In 2018, the company will be focusing on technical engine asset management services as well as flexible MRO and asset management solutions for asset owners and operators. 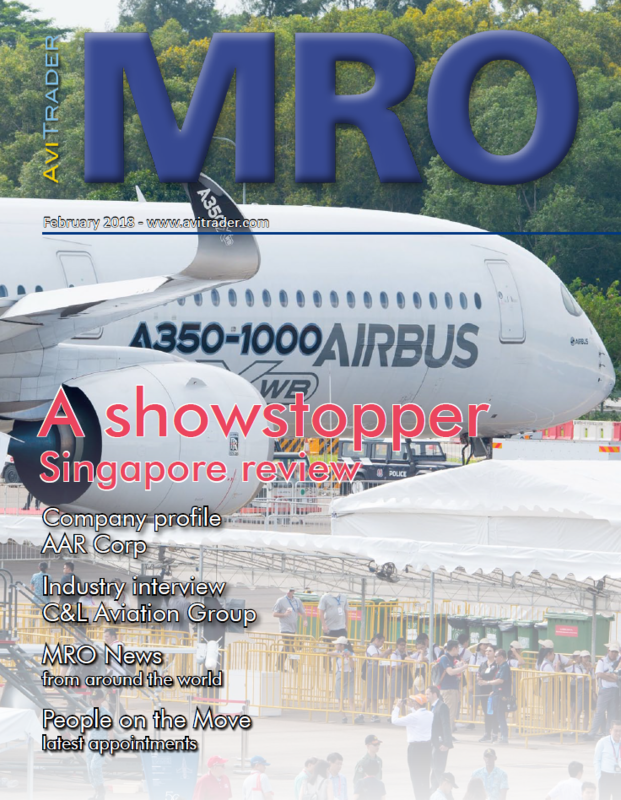 Airfoil Services (ASSB), a joint venture between MTU Maintenance and Lufthansa Technik, also had a successful year in 2017. Repair volume increased by around 35% year on year. Growth was down to strong demand for CFM56 blade repairs and continued strong volume in V2500 blade and vane repairs. Furthermore, ASSB started repairing LPT and HPC blades for GP7000 engines last year and is a single source supplier for these components. Alongside MTU and LHT business, third party work makes up 36% of ASSB’s business. Within the MTU Aero Engines AG, the commercial maintenance business achieved the highest growth rate in terms of revenues in 2017, having increased by 19% to €2,285.3m (2016: €1,914.4m). The company’s revenue forecast for its commercial maintenance business (MRO segment), expressed in U.S. dollars, is for a growth rate in the high teens in 2018. Aeroco Group International, based at Manchester Airport, a leading specialist in aircraft cabin and component maintenance, has announced further investment plans that will double the size of its brand-new state of the art facility due to growth in customer demand. Just weeks after acquiring their new facility at Stockport, Aeroco Group International has taken the decision to secure an additional 20,000 ft², increasing the capacity to 40,000 ft² in total. The fit out is already underway and due to be completed and operational by the middle of this year. The new premises will support their increasing customer base of airlines, leasing companies, MRO’s and component traders with industry leading aircraft cabin and component maintenance and advanced manufacturing services. AJW Group has secured a power-by-the-hour (PBH) contract with new Argentinian low-cost carrier, Flybondi.com. The long-term contract, which covers their rapidly expanding fleet of B737-800 aircraft, will see AJW use its expertise to manage the complete supply, repair and overhaul of Flybondi.com’s rotable components. This will ensure that Flybondi.com’s customers benefit from improved efficiency thanks to AJW’s streamlined supply chain management. Flybondi.com, based in Buenos Aires and Cordoba, is the first low-cost carrier in Argentina. Launched earlier this year, the airline will operate across 85 domestic and international routes. It is run according to an agile business model which is focused on continuous improvement and optimization of processes, alongside driving new innovations in the aviation industry. Boeing, through its subsidiary Jeppesen, has reported the continued integration of data services for business aviation operators with the introduction of Jeppesen’s global digital terminal chart data to the Honeywell GoDirect Flight Bag Pro electronic flight bag platform. Independent aircraft leasing company AeroCentury has announced that shareholders of JetFleet Holding Corp. (JHC) have approved the acquisition of JHC by the Company pursuant to the terms of the definitive Agreement and Plan of Merger (Merger Agreement) between the Company and JHC. JHC is the parent of JetFleet Management Corp. (JMC), which has managed the Company’s operations and aircraft portfolio since the Company’s founding in 1997. AeroCentury currently anticipates that the remaining conditions precedent to consummation of the Merger under the Merger Agreement will be satisfied in due course and currently anticipates closing of the merger in early April 2018. FAI Technik GmbH, part of the FAI Aviation Group, has signed a dealership agreement with Rockwell Collins to become one of its accredited dealers. 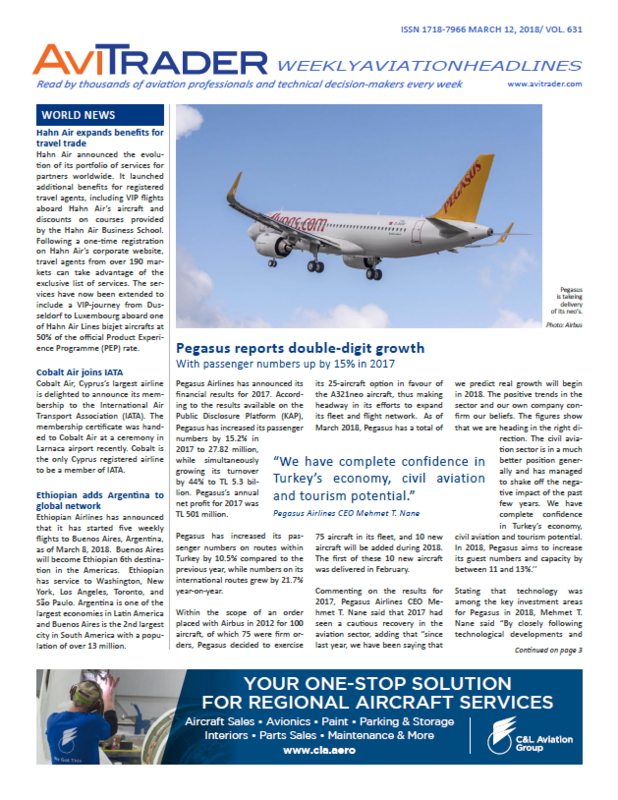 Rockwell Collins’ Regional Sales Manager for Germany, Robert White, commented, "Given FAI’s growth since 2016, we believe we are best placed to take advantage of the upturn within business aviation. Adding FAI Technik to our group of dealers in Europe brings an encouraging scope to both our cabin and avionics capabilities, providing our customers with targeted aftermarket solutions being carried out by a competent and qualified dealer."